Today I want to discuss a few things in relation to your dog’s weight. What’s healthy? What causes weight gain? How can you safely shed excess pounds? I’ve come to the conclusion that many people are unclear about what a healthy body weight looks like on a dog. “Dogs who eat raw/home-cooked always look too skinny …” is something I’ve heard three times just in the past week. I've also witnessed people point to a particular dog and say "That dog is too skinny." Only to look over at the dog and see that it's in perfect condition. Here’s what I think: for many people’s pups, a little excess has become the norm. But whether it’s an inch to pinch, or several inches, it’s harming your dog’s health and quality of life. Below you will find a Body Scoring Chart. Every veterinary office has one - not for their reference, for yours. I asked a former veterinary clinic employee why it is that so many owners have no idea their dog is overweight. Her answer: “Many people take the insinuation that a pet is overweight as a personal accusation. The truth is most owners don't know what an appropriately sized pet looks like, or when their pet's weight gain has gone too far, as they see them every day and may not notice there’s an issue. A vet has to sensitively bring the matter up, and many times clients will become agitated, as they often perceive that they are being blamed for the problem. It's sometimes easier for vets to not bring up the issue at all.” So like many aspects of your pet’s healthcare, you need to take matters into your own hands. Knowledge is power. Take a good look, and be honest with yourself. Keep in mind that just like humans, each dog is different. Some of us have trouble gaining weight, and some of us have to work to keep it off. Be sure to rule out problems like thyroid disease before putting your dog on a diet. Other contributing factors could include age (older dogs require more protein but fewer calories), being over fed/over weight during puppyhood, poor feeding guidelines on commercial products (there’s is actually no one size fits all measurement), and excess treat consumption - especially things like dental chews, many of which actually contain sugar (really, who comes up with this stuff?). Why is weight so important? 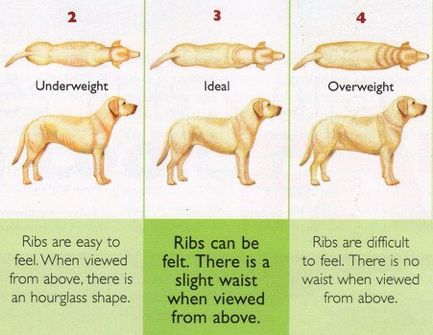 If your dog is overweight and remains so, his life span shrinks. Truly it's that simple. Excess weight in dogs increases the likelihood of injuries, it stresses their joints, increases pain associated with arthritis, and increases the likelihood of osteoarthritis (and at an earlier age). It can also lead to cardiovascular, pancreatic and liver disease and diabetes mellitus. Why are dogs who eat real food generally better proportioned than the ones who eat kibble? Well, I think the answer is obvious, but I’ll explain. Firstly, kibble is extremely calorie-dense. Factor in that processed foods (which kibble is) have an adverse reaction on the body’s natural digestive process, and actually slow down metabolism. Metabolism is the process that creates energy from food, and keeping it stable maintains energy level and body weight. If your dog is overweight and you’re having trouble taking it off, “diet” kibble is not the answer. Essentially you’re trying to fix a problem with kibble that was caused by a different kibble. In my opinion, weigh loss kibbles are nothing more than starvation diets. I know that might sound extreme. But take Purina OM for example: its primary ingredient is corn in two forms (a common allergen, not easy to digest). Next up, two forms of soy, another common allergen. Fifth ingredient, “beef and bone meal” (only those at Purina know where that bone meal comes from). OM also contains defluorinated phosphate, a commercial feed ingredient also used in agriculture for pigs and chickens. How does this cheap, processed food create a feeling of fullness when it’s lacking in quality nutrients and protein? I soaked a piece in water and watched it grow. All kibble expands when moistened, but this one grew the most of all the products I tested. This kibble may help your dog lose weight, but I promise you his body doesn’t recognize it as food. And in the long run, it might be doing just as much damage to his organs and lifespan that being overweight does. So how can you safely help your dog lose weight? Easy: feed real food. For starters, you control the ingredients in the diet. The best part of a customized, home made diet is that all the nutrients your dog needs are present, but you can easily avoid excess calories and fat. Feeding three smaller meals throughout the day and providing mental stimulation and regular exercise (as long as the dog is otherwise healthy) will complete the protocol. All the while your dog will feel satisfied because he’s consuming high quality, digestible nutrient sources. In cases of obesity, we taper the calories down slowly by calculating the ideal/healthy amount of weight to be lost each week. Also note that high-quality, bioavailable protein promotes muscle development; muscles help burn fat. If your dog is underweight, it works the same way. You can control every aspect of his diet and increase the caloric content without feeding dangerous amounts of fat or excess minerals. On the other hand, if you were to simply feed more kibble to put weight on your dog, he’d just be consuming more processed food. Also, too much kibble can create a feeling of discomfort once it starts mixing with gastric juices and expands. Real food, prepared and portion controlled by you is the better way to a healthier, happier dog. My story? It creeps up every fall, and somehow I still let it happen. My own gal, Millie, is fat. Most dogs eat less in the summer, my other dog certainly does. Millie, not so much. She finishes every meal, plus she munches on the pears that fall from the tree in our back yard. Oh, and sometimes we let her finish what Joey leaves behind, justifying it with “it’s just a teaspoon of food.” Couple the extra snacking with a slower pace due to the heat, and there you have it - an extra kilo. My beagleXdachshund, who had spinal surgery at the age of 2 (before she was my dog), is overweight. So what to do? Millie’s ideal weight is 7.5 kg but currently she’s currently weighing in at a hefty 8.6 kg. I designed a diet that contains the proper amount of calories and fat for a 7.5 kg dog, and made sure it’s complete and balanced with all the right nutrients. All at once I made enough food for two weeks and weighed the entire batch. To be sure I’m not tempted to give in to that sad little, hungry, beagley face, I gathered 14 containers and put one day’s worth of food in each one. I’ll split it up each day as breakfast, a small snack and dinner. And I’m certain that in about 8 weeks, I’ll have my slim and trim girl back. Updates to come. If you’re battling canine weight-gain (or loss), there are safe ways to help naturally, though the use of a wholesome, balanced, real food diet, which will also help your dog to feel less hungry. Do it for health and longevity.